@moodlefairy yes, well it IS good to know that we are not going totally crazy 😉 a little bit is okay of course. Updating my two #moodle 2 test servers with Preview 4 release http://tinyurl.com/39wmkou – time to schedule more playtime with it. 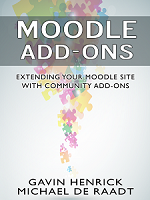 RT @markdrechsler: #moodle 2.0 Preview 4 now available – get it while its hot: http://bit.ly/aPfxHH – w00t!